Ok dudes, I registered. Officially. I know the conference is not until August of 2011, and I know the Early Bird pricing is on sale until February, but I got an email today about how they do sometimes sell out, and how if you want to go, you should just buy the damn ticket already (I'm paraphrasing, here). And since I just deposited my first paycheck from Lunchbox, I figure I should buy the ticket before I spend the money on something else. Like food. Or shoes. 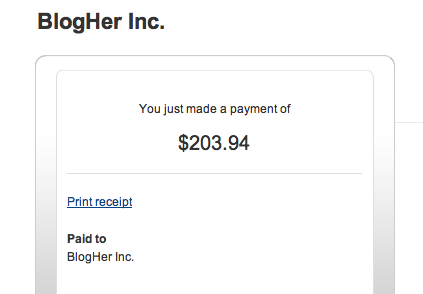 Cause I promised myself that I'd use this money to pay for BlogHer. If you are going, or planning on going, or wanting to go(ing), and you haven't filled out my awesome survey yet, please do! Oh look, here it is again! There are so many of you that I want to see and talk to and hug and cheers and learn with. Let's do this! Is it too early to book a hotel room? BlogHer's website says it's not, and they have a special block room rate ($199/night), so fill out that form and let me know if you want to get in on some sharesies! In a couple of weeks (arbitrary date: November 30), I'll send an email to anyone who signed up on the "I want to stay in communication with you about what you're doing at BlogHer '11" email list so we can start talking. To each other.